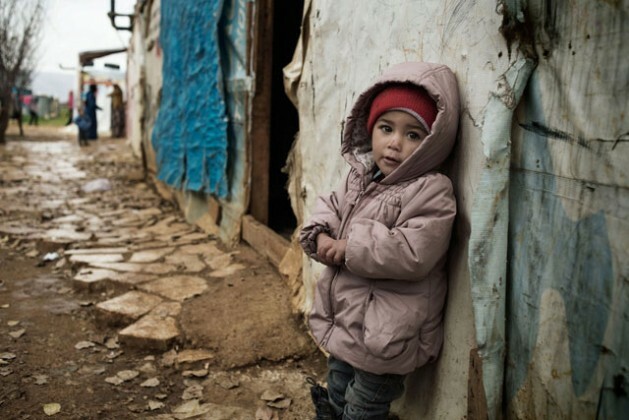 UNITED NATIONS, Mar 9 2016 (IPS) - Seeing children dying due to a lack of doctors and medicines, and seeing them grow up in a society with no food, schools or text books, is the reality of the daily life of more than 250,000 Syrian children currently under siege in the war-ravaged Middle Eastern nation. The besieged areas in Syria have turned into open-air prisons, where children and families are trapped, surrounded by warring groups preventing food, fuel and other vital supplies from entering and also stopping people from fleeing. 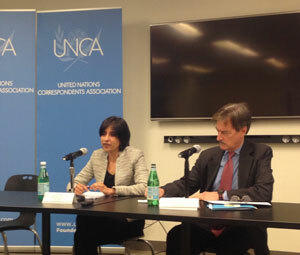 The crisis situation is detailed in the latest report “Childhood Under Siege” released by Save the Children, and presented at a press conference sponsored by the UN Correspondents’ Association (UNCA). The Syrian conflict, which is now entering its sixth year, has resulted in over 250,000 people killed. 4.6 million Syrians fleeing the country, 6.6 million being internally displaced and over 13.5 million in need of humanitarian assistance. A Syrian mother, a resident of Ghouta, a suburb of the capital of Damascus, is quoted as saying: “The medical station here is no more than a table, a sterilizer and a piece of gauze”. Sonia Khush, Save the Children’s Regional Syria Director, explained how in Madaya the only doctor left is a vet, whereas in Moadamiyeh three out of eight were trained as dentists. In some cases, when people need to take painkillers, they take one pill every three days. There are no vaccines and no medicines for chronic diseases such as heart conditions and diabetes. The repercussion of this situation is not only physical, but also psychological for women and children, as they grow up far from a safe environment, and too close to a culture of war, she added. “Children are in constant fear of air bombardments, which are dropped more in besieged areas than in any other parts of Syria,” said Khush. Data from the report were collected through 22 conducted focus group, and interviews with more than 125 parents and kids living in eight different besieged areas of Syria. The results revealed that Syrians have been forced to cut the number of meals per day, by half or more. In seven of the groups (32%), people said they sometimes were unable to eat a meal per day. Four of the adult groups (24%) reported that local children have died because of lack of food. Parents in 14 groups (84%) reported their children becoming more aggressive, withdrawn or depressed. Despite six resolutions adopted by the U.N. Security Council since 2014, calling for a humanitarian access in Syria, the number of people living under siege has more than doubled in the last year, along with the number of bombings. “The entire civil society in Syria — which prior to the conflict did not exist — is trying to rebuild a broken society through the contribution of women and men who, despite the daily risks, are determined to be part of the solution”, the Syrian volunteer added. “It is important for us to have started already the process of rebuilding the country, giving back people their dignity and ownership,” she underlined. “Located in Damascus, we work in areas controlled mainly by the rebel groups” the volunteer told IPS, “And through a strong network of volunteers and local councils we check daily if areas get bombed, schools get attacked, and if children went out safely. We directly talk to people,” she said. In areas such as Eastern Ghouta, which is mainly an agricultural land, people do not want hand-outs anymore. When supplies get sent in, people prefer seeds, tools and agricultural equipment, Save the Children’s Regional Syria Director said.